Opting for your operating system you will find links to download the file required for your Enemy Territory. ET Pro 3.2.0 requires the ET 2.60 patch (available bellow). Unzip etpro-3_2_0.zip there, it will make an etpro directory and place all the files in the proper paths. On the command line that will now be available for editing appending +set fs_game etpro to the command line. Start up your game, appending +set fs_game etpro to the command line. On your server, cd ~/.etwolf Unzip etpro-3_2_0.zip there, it will make an etpro directory and place all the files in the proper paths. This is the original patch selector for Enemy Territory, edited to support ET patch 2.60b. Use this to switch between the various patches depending on what servers are running which patch! You can still get this file but we suggest you have a look at the NEW/UPDATED VERSION first! When you need to minimize your ET screen hit "alt" + "z" and the ET screen will minimize to your task bar. When you want to bring ET back up, press again "alt" "z" again. Staying active in your System Tray until the moment you want in the same Windows session. Being able to be disabled. You can host it on your desktop to fast load when you will play. 1.2) Minimizor (471Kb) (Current Version 1. If you got problems with certain games, found bugs or got suggestions about making Minimizor better then go to www.idcation.com and leave a message. To use this program just start it up and set your hotkey, this can be done in the options menu. When you minimize the game you can get back to normal mode by pressing the same key or keys again. Instalation: Just unzip the exe file in any folder and run it. Start the ETWC, set a hot key, and click "enable hotkey", the run Enemy Territory in full screen or maximized, when you want to go back to desktop just press the hotkey, to return the game press again the hotkey. This application also change your screen resolution according the window state, the resolution values of desktop or game will be set automatically. Issues: When you minimize ET the gamma of desktop will be change, but this is normal, the gamma will be corrected as soon as you close the game. Lets sue several options in use, you choose among the servers of Bunker Gaming you want to download the maps, I mean, you just want to download the files (maps) of B1 which is a new campaign and new maps. He will help you in this task without it being necessary for you to be running the game for that. After downloading the maps optados, you can use it to start your ET. The best thing is: You have easy access to a possible technical support because the developer is one of our members and Moderator of the Forum (Lynxx). More details you can find out HERE. Faced with the growing demand for cheaters, it was necessary a tool allowing administrators split the clean players of the dirty, avoiding confuse them with cheaters that use of illegal ways to take prominence in the game. This tool came as a response to global games multiplayers how to PunkBuster known as active on servers. Allowing the servers that it is active, minimizing the task of administrators to maintain clean their "home". In periods not accurate, are released updates for both the servers and for client. But even taking this option turned on our game it does not always work as it should, generating a wide range of errors to clients (players) that literaly are disconnected from the server. So even being active on your ET he does not always behave as expected, making an update automatically through the online game. That is why this tool was developed for the client (player) use, making the upgrade of the PB to the latest version available with a fast and easy use for all games supported, that the client (user/player) you have installed on your computer. We suggest, strongly, that only connect to servers that have enabled the PB, avoiding problems in a well near future. More details you can find in our forum on topics as 17003 and 16008. You must have download it from the PB site and fill the box-captcha. 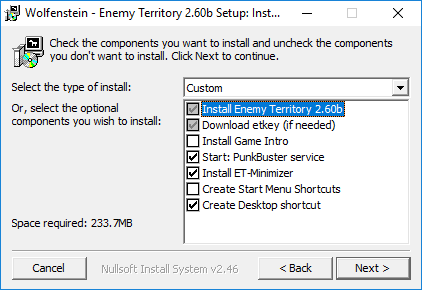 c) Accept the terms of the license by clicking "I Agree"
d) Click on "Add a game" and select "Enemy Territory"
e) Click "Check for Updates"
This tool allow you Install/Re-Install, Un-Install/Remove the PunkBuster Service of your ET. On your choice, it removes and re-install the files PnkBstrA/B of your PC. Later use the option Test Services (button) to see if all is fine. I also strongly recommend that you make use of PBSetup after this, to make sure that he has updated his game for the latest version available. 3.3) Should I allow the client version of PunkBuster installed on my computer to access the Internet? For who desire to talk/chat (voice) with anothers players on the game Ventrilo 3.0.5 is the next evolutionary step of Voice over IP (VoIP) group communications software. Ventrilo is also the industry standard by which all others measure themselves as they attempt to imitate its features. Ventrilo is best known for it's superior sound quality and minimal use of CPU resources so as not to interfere with day to day operations of the computer or during online game competitions. It is also preferred for the simple user interface that any first time computer user can very quickly learn because the most commonly used features are immediately visible and can be activated with a single click of the mouse. To see what the program looks like and a list of some of the many features the program offers please click HERE. If you use any operating system (NT/2000/XP/2003/Vista,Seven) with a user account, you may have problems with the game. It will not let you access the full game online. I suggest that to start the game always do so using any account of the system administrator, because this way may choose to do that the game is allowed even taking the active firewall, we know that the player not using that previlegy account will face problems. As not connect to any server (appear as offline) do not load properly the files of the unpleasant PunKbuster generating errors that irritate everyone. 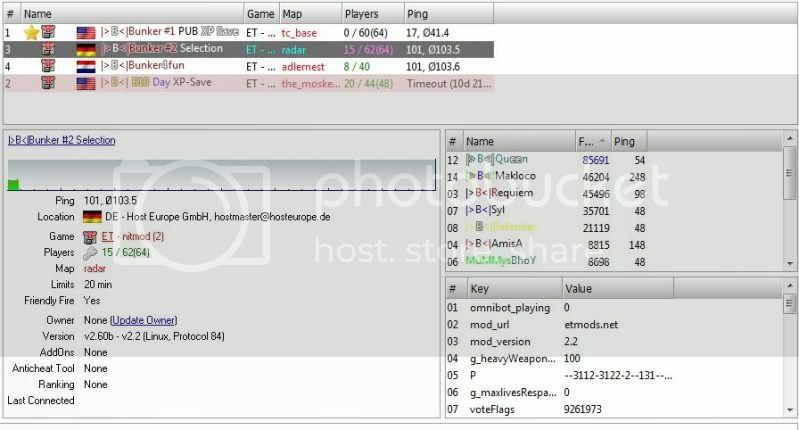 After installation and connect your game with some server will be created on your computer (...\ Wolfenstein - Enemy Territory\etmain) a file named etkey. It is a really small, which occupies little storage space but of enormous importance. This will be the file, single, responsible for its identity and differentiation from all the other thousands of players in the universe Enemy Territory. It's your most precious of the game, he is responsible for by his recognition before the servers of all the privileges that have them. It should be one (or more) copy as soon as possible (if you have not already) and stored in a secure and accessible only to you. Maybe you can (if you wish) to keep him in a personal account, e-mail, pendrive, memory card from your cell phone, your palmtop, or any floppy. Ya use your imagination and store if on a safe place where u can easy pick again. Otherwise possible that can do so safely and easily. Nobody is responsible for the possession of this file unless you, we will not allow someone to have access to it, if your computer has to be formatted, the HDD broke, take his computer was fixed by another person has in mind that he may have access also that your. So WE always said that the responsibility of each player by the use of your identity is only him and no one else. It was like a credit card, complete acceptance in every place. You would or would your credit card so that anyone can easily use? Well if the answer is negative, already know what and how now. 07) Problems could always occur after an innocent navigation through the Internet, use of file-sharing programs, reading e-mail, etc..
Not all sites and hosts has a concern for the visitors, and there are those that install codes through as drafted/write the page, whether in a picture available, is a button to click. Installing on your computer for a variety of purposes, whether cookies, dataminers, hyjacks, trojan-horses, spyware and an infinite variety of malware possible. None of these files it is beneficial, just headaches. So always keep your Temporary Internet Files clean whenever possible. I also programmes for the use of windows environment in which much help the user/administrator to take your PC "clean" of problems cited in this item. 8.1) Ad-aware - Free (122,79Mb). This version is free and without its expiry. It works perfectly for what I speak. After installation, use the function to update to update the information necessary for full operation. There is a period between updates of 7 days (usually). 8.2) Do you have the suspicion that your computer is infected with a VIRUS? I would hold a scan on your PC by a virus without the need to install or buy some antivirus? Here I quote an example of how you can do this without spending a penny. The Symantec provides tools that lets you check on your pc online through your browser and the installation of ActiveX files safe. Download and install Norton Security Scan. It will automatically scan your computer every week, replacing the need for you to manually scan using Symantec Security Check. Its quick, easy, and best of all, its free! You have 2 choices, Install (Download Now!) or click in "Continue to Symantec Security Check"
Click on the Start button on the item Symantec Security Check and good hunting. Observation: In this option you can also test the vulnerability of your computer on the internet. Try Norton's PC security free. Give your PC a free online virus scan. Or just test drive one of our free latest betas. Norton's antivirus solutions offer up-to-the-minute protection for your PC from viruses, spyware, adware, backup and multiple new security threats. NEW! Lets you access backed up files over the Web. Creates full system and file backups. Enables convenient, secure offsite backup. Backs up on schedules and events. Symantec pcAnywhere 12.5 is the world's leading remote control solution. It lets you manage computers efficiently, resolve helpdesk issues quickly, and connect to remote devices simply and securely. New features include smart card authentication and native whiteboard support, while continuing to enable remote users to find, connect to, and control the hosts they need. Identifies unsafe and dangerous web sites right in your search results. Professional-strength antispam protection to block unwanted emails. Prevents hackers from stealing your usernames and passwords. Displays with 800 x 480 support and 1024 x 576 screen handling. NEW! Identifies unsafe web sites right in your search results. IMPROVED! Helps stop online identity theft, viruses, spyware, bots and more. IMPROVED! Helps stop attacks before they get on your PC. Uses intelligence-driven Norton Insight Network for faster, fewer, shorter scans. Stores files on separate storage arrays at the data center for added file safety. Eliminates relying on external backup drives, memory sticks and memory cards for back-ups. Guards your data with ultra-secured, government-grade encryption. NEW! Delivers clear performance and threat explanations. IMPROVED! Helps stop viruses, spyware, bots and more. Speeds up PC boot time by prioritizing startup programs. Defragments and repairs the registry to help ensure programs open quickly. Optimizes the hard disk to free up disk space and recoup system resources. Automatically detects and fixes Microsoft Windows® issues. Removes a failed installation or a damaged Norton product from your PC. Helps uninstall Norton products released between 2003 - 2008 and Norton 360 from your computer. Use the Norton Removal Tool to remove a failed installation or a damaged Norton product. Warning The Norton Removal Tool uninstalls all Norton 2009/2008/2007/2006/2005/2004/2003 products, Norton 360 and Norton SystemWorks 12.0 from your computer. If you use ACT! or WinFAX, back up those databases before you proceed. This is an advanced registry cleaner for Windows that can clean and repair problems with your registry. It help fix problems with the Windows registry that are a common cause of crashes, slow performance and error messages. Recommended utility to safely clean and repair Windows registry problems. Repair invalid registry entries - a common cause of Windows crashes and error messages. In this new version, much more invalid keys will be deleted from registry by making Windows has a better performance. And now with the option to restore directly within the program. 09) - When having problems with the game try to annotate the message of the error, it will help you with the information to seek a solution focused on this. If you can make a screenshot. All this will bring a quicker response to the problem. 10) - Where it is possible, avoid that your files using more than 85% of its HDD it allows you to make periodic comprehensive maintenance on it with the minimum environment to use, for example, the disk defragmenter. 11) - Try to have your computer updated with the latest UPDATEs available -->http://www.update.mi...6/default.aspx? 12) - Whenever post to our forum about problems in your game, try to always provide a good amount of detail possible it will help to efiente rapid response. This kick is usually caused by one of these progams are running togheter with ET. can be any of those listed above (13.1) but being one of those below, it is easy to follow steps and solve. This error occurs in the client versions of Et when starting the game from an account that does not have the privileges of administrator, when the user chooses to use an administrator account to run the game this error is fixed, leaving each of the 3 minutes automatically be expelled from the game by PB. Forum Link --> O/S Notice, another topic. Uninstall the Punkbuster using the PBSVC (3.2 Item) running it FROM another location, maybe a CD,DVD,FlashDrive BUT NOT ON YOUR same HDD. Restart your Windows, I mean, make a reboot. Later run AGAIN (YA AGAIN) the PBSVC and use it following the steps above (3.2 Item). Now use the PBSetup (3.1 Item) and make step by step how was said above (in 3.1 Item). Use it to remove the Game of the PBSetup menu, and later, adding it again. ow, on this time u must use the this folder/directory and to finish, make the update of the PB again. To use these key combinations: Shift + ^+ the character on the pic above. Special thanks to Fragger for the German translation, support, and test server! RconIT copyright © 2006 GameDesign-Online.com and the respective owners. X) Add the Color table so that you can customize your surname, speeches etc. XI) Update links, infos, pics, and adapting to the new version of our forum. Edited by -=BRASIL=-, 08 November 2018 - 12:48 AM. An ET minimizer for Linux would be good.!.! Hi, like always Brasil you have good ideas!!! i can add a software to minimize ET, cause i had problems with etminimizer (some have other not). So it is q3 minimizer, it works for all games which use q3 engine. But thanks for your imput, things like there keep push the people to share ideas, knowledge, and improving doing what they can. then, to keep contact and share with game mates, you can use xfire: it allows to launch your favorites servers directly through the software, you can see who is online and where, and you can discuss with online mates! The worst way to do it is to leave it here and let all the comments drown out the good info. - I will add the topic about ETPro or i will link (i make months ago one here on forum). - About be a clean topic: Ah!!! But is nice see an thread growing, see the feedback from the anothers folks. - Later i will do a search for the servers what Host the game and the updates. i liked this idea, but i think will be too much large topic. but i will do it ASAP. Note: You can suggest a moderator to make this topic something fixed. How is the entire time you want someone to communicate with a moderator who read about something in the forum, simply click the button! REPORT (lower right side of the post) that you have such direct access to staff of moderators. Usually it is used to report any fact which needs the attention of a moderator in the forum that was placed on that topic/post. Update links, infos, pics, and adapting to the new version of our forum. Maybe this can be moved/fixed on some area as FAQ/Hardware,Software/Help Desk. moved to trick and tips! How i liked too much and I guess this can help few anothers players (who like "tune" the ET) maybe this will give the north about the collors scheme on the game. I think HLSW would be a great addition to the list. It was suggested to me as an admin tool, but I use it more to tell who is on what servers. It reminds me of the All Seeing Eye yahoo used to have. Screenshot is from a few minutes ago. Edited by -=BRASIL=-, 29 July 2012 - 06:50 PM.